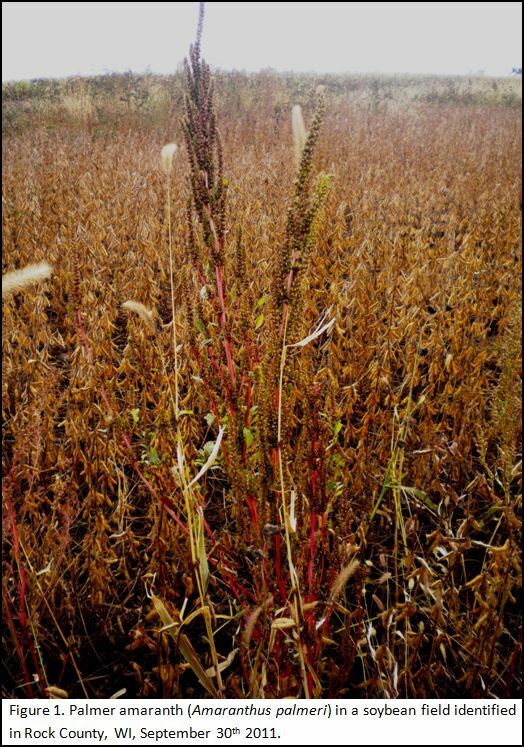 Palmer amaranth (Amaranthus palmeri S. Watson) is a very problematic annual broadleaf weed for many cotton and soybean producers in the Southern and Mid-southern U.S. It is a ‘cousin’ to other pigweed species more commonly found in Wisconsin crop production fields such as redroot pigweed (A. retroflexus), smooth pigweed (A. hybridus), and common waterhemp (A. rudis). It is especially problematic in areas where biotypes are resistant to glyphosate and ALS inhibitor herbicides, which drastically limits control options. It is also problematic because it is a highly competitive weed, and it has been shown to be the most competitive of the pigweed species. It has an extended germination and emergence window, rapid growth rates, high water use efficiency, and produces large quantities of seed. Moreover, Palmer amaranth is dioecious meaning there are male and female plants like waterhemp, and also like waterhemp, it expresses the ability to quickly evolve biotypes resistant to herbicides. Palmer amaranth is reported to have glyphosate-resistant biotypes in Georgia, North Carolina, Arkansas, Tennessee, New Mexico, Alabama, Missouri, Louisiana, Virginia, Illinois, and Michigan. The weed also has reported biotypes resistant to ALS inhibitors in Tennessee, Kansas, Arkansas, North Carolina, South Carolina, Georgia, and Florida. And, it has biotypes resistant to photosystem II inhibitors (triazines) in Texas, Kansas, and Georgia. Why do we care about the difficulties producers in the South are having with this weed problem? Because it is apparently moving North, and it is [now ?] in Wisconsin! 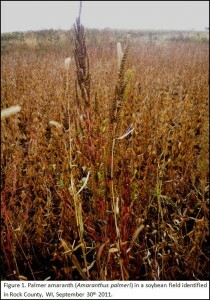 This weed was found in a soybean production field in south central Wisconsin, Rock county (Figure 1). 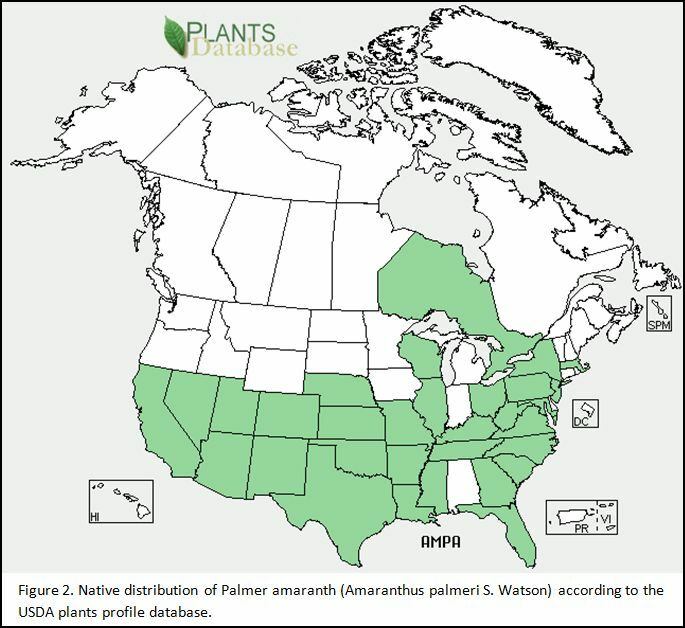 According to the USDA NRCS plants database, Palmer amaranth (Amaranthus palmeri S. Watson) is a native amaranth of Wisconsin (Figure 2). However, as of early October 2011, there were no reports and no current distribution information at the Wisconsin State Herbarium or the Robert W. Freckmann Herbarium, University of Wisconsin – Stevens Point. On the Robert W. Freckmann Herbarium website, it was classified as ‘excluded’. Moreover, Dr. David Stoltenberg said Palmer amaranth is not a weed he has ever known to be found in Wisconsin crop production fields. So, while it may be considered as a native plant species to WI, it certainly has been a ‘very rare’ weed at best. This finding is important to share because it is consistent with recent findings in Illinois and Michigan. Dr. Aaron Hager of the University of Illinois noted in 2005 that while Palmer amaranth can be found in the southern 1/3 of Illinois, it was moving north in the state similar to the movement of common waterhemp in the 1990’s. By 2010, glyphosate-resistant biotypes were confirmed in Illinois. In Michigan, the USDA database does not show Palmer as a native plant species in the state. However, in 2010 Palmer amaranth was found in production fields with control failures in St. Joseph county Michigan which is a southern county boarding Indiana. By April of 2011, those populations were confirmed to be resistant to glyphosate. These are trends that we prefer not to repeat in WI. What should be done this year? Consistent with my previous article about the importance of late season weed scouting, if you have pigweeds that escaped control in soybean or corn fields this year, you should take the time to correctly identify what type of pigweeds they are. It is very difficult to accurately distinguish between many of the pigweed species without flowering parts, so now is the time to identify these correctly, not next spring. Instead of me rewriting detailed instructions in this article that enable you to distinguish between pigweed species, I’ll direct you to the Identification of the weedy pigweeds and waterhemps of Iowa publication with the website URL posted below. It is a very good resource put together at Iowa State University, and it is well illustrated and detailed. Some key identification points to alert you to whether you should go to the detailed characteristics are: the stems lack hair (like waterhemp), the flower heads are long and somewhat skinny, and the flower heads are sharp (prickly) to the touch with bare hands. The flower heads are sharp to the touch because of long and ridged tepels that cover the seeds on the female plants. If you are pretty sure you have Palmer amaranth escapes in production fields, please send me an email and let me know. If you’d like to have me double check their identification, collect several female plants in a brown paper bag and get them to me. If you do this, please note the location of the sample collection (with GPS coordinates if possible), and also provide any production history if possible. If you send these samples through the mail, place in a box that is very well sealed with tape to prevent the chance seeds will escape the box.